Designer trainers – or sneakers as our American friends call them – are all the rage. A cynic would say that’s because brands have realised they can make big margins on a cheap, lightly designed product. An optimist would say it’s a reflection of men’s increasing desire for stylish, quality clothing that can transition from formal to casual. As always, the truth is a combination. I like classic, high-quality trainers, as recent posts on my Common Projects and Levels of Formality have showed. But I’m not going to buy designer trainers, just like I don’t buy designer T-shirts. I want simple, subtle design and high quality. Both because it won’t go out of style, and because the vast majority of the time it’s the only thing that works with the tailoring and classic clothing we write about here on Permanent Style. I like wearing my Common Projects with chinos (usually Incotex) but also with flannels. I rarely wear them with a jacket, but if I did it would be a cotton one like my green Reillo, with linen trousers and an open-necked shirt. But, for a trainer to work in this context it has to be of a certain design. It has to be, in some ways, similar to a dress shoe. The first thing a trainer needs to work with smarter clothing – and one that people often forget – is slimness. The shoe must be slim not just because that makes it more similar to a dress shoe (though it does), but because it enables a trouser leg to sit nicely on top of it. Chunky running shoes look awful with smart trousers partly because the material gets bunched up on top, and ruins the line of the trouser. This is one reason Converse are so often worn with smart trousers – particularly well by women actually. It’s not my style, but that’s one reason it works. The Stan Smiths on the right above, by contrast, are too wide. Dress shoes are dressy because they have an austerity of colour and line. When the addition of small lines of holes can shift an entire shoe from formal to informal, the margins are small. So for a trainer to be remotely dressy, it needs to have the same simple, sleek look. No chunky eyelets, no oversized laces, and a sole that is neither too thick nor too thin. Although the Buttero example above-right is slim and has a good sole, it has cut edges and thick leather laces, which make it too chunky. The Givenchy on the left, by contrast, is everywhere simple and pared back. An elegant trainer will likely be one single colour – the more changes in colour, even subtle ones, and the more it risks losing its simplicity. This is why the majority of new designer trainers are white. I would argue even bright single colours are better than multiple conservative ones. 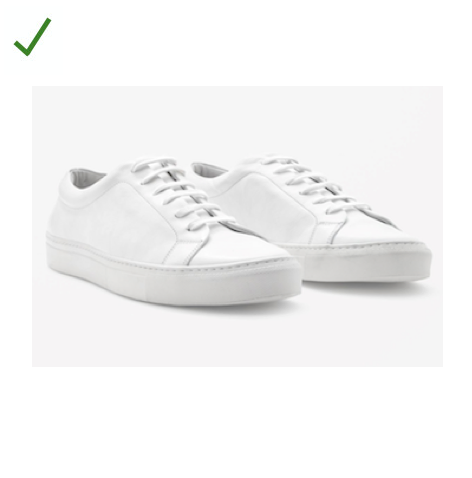 In the examples above, the Common Projects sneaker on the right has a differently coloured sole, where the Cos example does not. It’s a small difference, but an important one – akin to a contrast welt on a dress shoe. A classic mistake people make here is thinking that a black trainer will be smart. Because a black dress shoe is, right? Unfortunately no. It just looks like you’re making a rather poor attempt to pretend you’re wearing a dress shoe – when a half-second glance makes it obvious you are not. 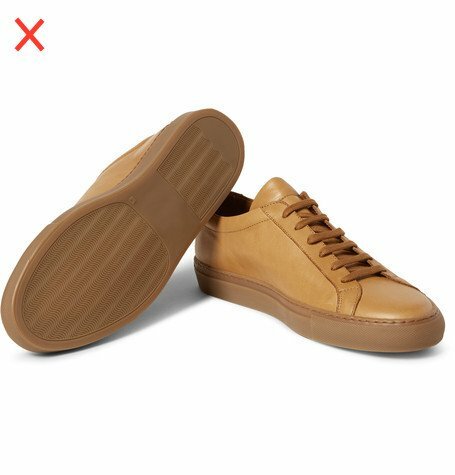 I’m not a big fan of tan or dark-brown trainers either, for the same reason that they look too much like they’re mimicking a dress shoe. A smart shoe is smart because of its simplicity and cleanliness of line, more than its colour. You don’t have to be a trainer obsessive, but look after your shoes. Wipe them down, keep them in a box. Even put shoe trees in them – it helps. A trainer will never keep as smart as a dress shoe – you can’t maintain or recondition the leather in the same way. But it will age and wrinkle a lot slower if you look after it. There’s a good video on trainer maintenance above from Mr Porter. I know there will be purists out there that shudder at the very idea of trainers. I’m with you; I get it. We both share a love of tailoring, but around that tastes can be narrow or broad. For everyone else, perhaps looking to experiment with sockless trainers under their cotton gabardine this summer, this is where to start. You can follow the discussion on How to wear trainers – 1: Design by entering your email address in the box below. You will then receive an email every time a new comment is added. These will also contain a link to a page where you can stop the alerts, and remove all of your related data from the site. Every man should have a pair of trainers. Mine are pink converse high-tops (size 15) worn at the seaside with shorts or budgie smugglers and a basketball vest. That is the only time they should be worn (apart from playing a sport). I have some photos somewhere but you probably don’t want to see them. Ever thought about writing a style blog of your own? Absolutely correct Mr. Lewis concerning when trainers should be worn. Wearing trainers in any capacity other than at the resort makes a grown man look adolescent which is to be avoided. There are plenty of other types of shoes that can be worn casually that don’t make a man look like he’s trying to be sixteen again. It’s a tricky area this, while I understand the desire to wear trainers for practical reasons, I’m not convinced that they particularly work with anything other than shorts, chinos or jeans and think that, even then, they can jar uncomfortably if a shirt or jacket is is remotely structured or formal. I find that desert boots can offer most of a trainer’s advantages but are easier to blend with any ‘smarter’ elements. Tricky to find good quality in this kind of thing though, and do think there could be an untapped market for something using decent materials that subtlety bridges the gap between trainers and a more regular shoe. Interesting point – I actually find that it’s when trainers try to bridge the gap that they go wrong. Hence the tans and suedes, or adding of broguing etc. I am fan of Common Projects and ordered them a while back so being a hypocrite as I write this. They are grossly overpriced and so are a lot of these other trainers. Yes, they look more sleek than most…but let us not delude ourselves. Reminds me of the Emperor and his clothes. Converse on the other hand, for the amount it costs, far more sane. Yes, unfortunately they have gone up steeply in price. To the point where they might deserve to be called designer trainers. I’ll address points about quality, make and value in another post. I got a few Common Projects myself.I like to wear them with Jeans and Chinos as you do on fridays and most at the time on Weekends. No Flannels tough. On the other Hand I do not agree on the subject of monotesim. The ones I wear most are Brown-ones (I even got one in a brown suede) with a white sole. I also got a White on White one like you, but it’s usually not me first choice. Maybe I should indicate that I’m 26 years old. That certanly has a huge Impact too. 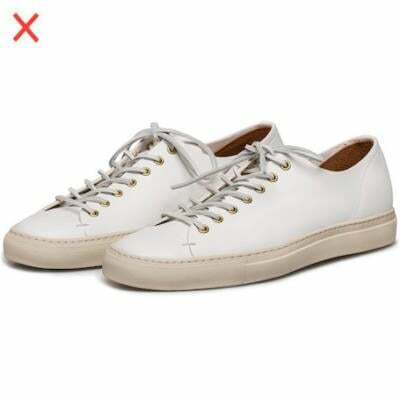 I would contend that “Common Projects” have become all too shamefully and sadly more than a bit “too common.” Trainers/sneakers are, after all, just that–shoes for everyday wear to and from the gym, casual wear, etc. 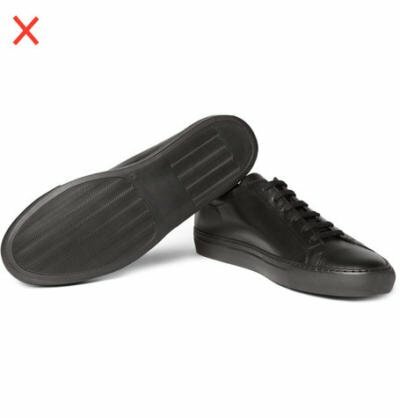 If one wanted to wear exorbitantly expensive trainers why not go all out, e.g., the John Lobb Levan trainer–i.e. go for the full gusto! I, for one, will stick with my clunky, well padded trainers–shoes designed for what they were intended to do–not try to put lipstick on the pig. Why would you wear trainers if not for training? It’s leading to sartorial car crash in my view. 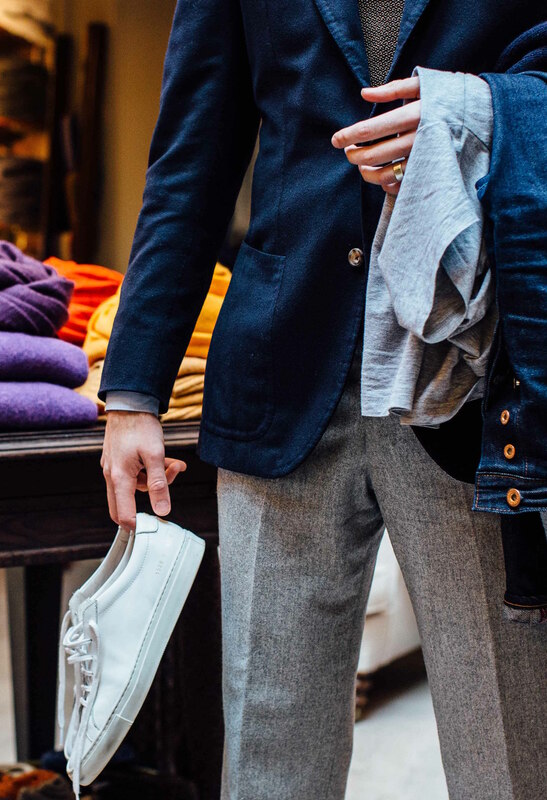 Espadrilles, driving shoes, boat shoes (at a push), suede loafers, and the like all do the smart casual thing quite well, depending on long/short/lightweight, etc., but trainers………keep them for tennis/running/ working out…..my goodness. Well, the name is hardly relevant is it? What do you do with a trench coat? But each to their own, I like them in this context if done right. Except that the manufacturers of “trench” coats have not really made a focused effort to move them from their original purpose or style to the point where they are a fashion statement in different shapes, materials, sizes etc., which is exactly what has happened to the trainer. Isn’t that exactly what Burberry have done? Wise words indeed that should be heeded immediately. Nothing looks more ridiculous on a grown man than trainers with a suit or sport coat and nice slacks. One of the pleasures of being an adult is dressing like one! And by the way, gentlemen if you think that women don’t notice your shoes you are sadly mistaken. I can assure you that women don’t want to see a grown man dressing like a teenager. Now you may not care one iota what other people think about your what you wear and that’s fine. Just be aware that people do observe what you’re wearing. So, please wear the trainers only in the appropriate venues of the resort,beach, or gym and enjoy the other excellent choices that Mr. Inkster has suggested. Agreed. ‘Age appropriate’ sounds such a priggish phrase, but seeing 40+ men dressing like teenagers is just wrong. The tyranny of trainers, like the tyranny of jeans, is a call to the barricades. Still, no baseball caps. Yet! I tend to agree about sneakers trying to look like dress shoes, but my threshold is quite different. The tan leather ones you posted I wouldn’t wear, but I have no problem with tan suede sneakers (especially because suede on sneakers often has a much flatter-looking nap than I find on dress shoes). As usual, much of style is personal. I was toying with some common projects ones, but in the end am going with a pair from shoes like pottery. I tend to just wear trainers with either jean or chinos, had never thought to wear them with flannels. They should never ever be worn with a suit!! Great article. Sneakers are now widely worn with suits, black tie but look best with jeans and a cashmere hoodie. The trend is certainly towards white but exotic sneakers like our Bianca Mosca alligator shoes also have appeal in certain quarters. A question which is more related to dress shoes rather than sneakers… As a first pair of bespoke shoes, who would you recommend between Stefano Bemer and G&G? If my info is correct, G&G is £4,000 incl. VAT vs. €4,250 or £3,400 for SB (also, SB includes a one-off cost of €600 for the last which will not be there for future orders). From your reviews, I understand that the level of make / fit is top notch for both and rather on par. That being said, it is practical to have G&G a few minutes away from where I work but also understand that Tommaso from SB travels quite often to London (btw, I was in Florence a few weeks ago and decided to stop by their workshop out of curiosity, really nice setting and staff!). Would very much appreciate your input. I’d say it’s largely a question of styles you like at that point – they are similar in terms of value and construction. And if style doesn’t sway you one way or the other, go with G&G for the convenience. I’m assuming your tongue is wedged firmly in your cheek? if not…..God help us! I’m all in favour of relaxed, louche suiting but consider Chelsea boots or suede shoes to be the perfect accompanying footwear. For hot climes when sporting linen or seersucker, moccasins, loafers or desert boots more than do the trick. Trainers should only be worn when participating in sports. Anything else leads to the sort of sartorial disaster perpetrated by Wei Koh in his ‘rake-creation’ article. OK, rules are made to be broken but good taste requires that we maintain a modicum of good taste and the only man that ever looked cool in a suit and trainers was Adam faith and that’s because he was Adam Faith and he was the only man I knew in the western world who had the chutzpah to pull it off ! Hi Simon, what jacket are you wearing in the top photo? I love my common projects but they are objectively too overpriced. I would argue that the Givenchy in rule 2 actually contradicts rule 1 in that its not slim. Having tried it I’d say its actually about the same width as the Cos both of which are probably wider than the stan smith (including the Raf Simons incarnation). 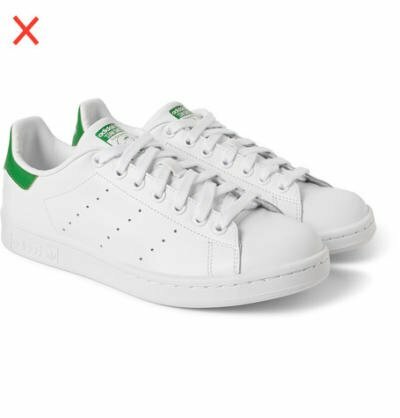 The Stan Smith is actually not that wide but is likely not to work as well as its laced more into the toe so the definition might not work as well with a tailored trous. That said despite a convincing argument, I’m less enamoured of the view that it must be slim for those with wider feet its not practical – yet you can still pull off the wider look. Though yes they may not be as elegant as Mr Cromptons plates. You just need to be more slective on the shoe and what its worn with. Other than that – a nice little primer with great attention to detail. Are we speaking of what are called “running shoes” in Canada? I was out at an event a while ago, and one local “rake” was wearing a tuxedo – with “flip flops”.. I guess it works if you are a true celebrity around 22 years old (with an image that screams ‘edge”), but not if you are a corpulent sixty – something attorney (which this individual is). So Simon, is there any particular brand of “flip flops” you can recommend that go with a bespoke suit? Or perhaps an off the rack Brioni? ……I can hardly wait for your opinion! No! Oh dear me no. Flip flops are ghastly even with shorts and a T-shirt. Who really thinks they have nice toes? 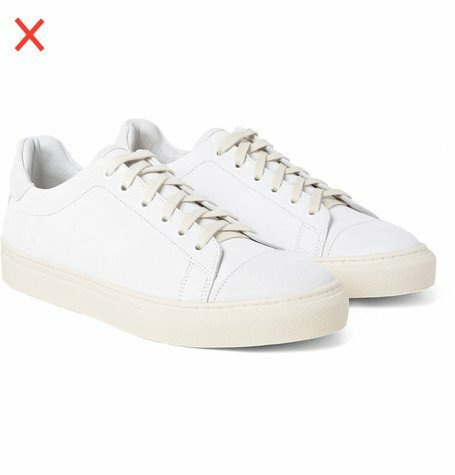 Common Projects way out of my price range. Settled for a pair of white Royales from Greats. Excellent quality and recommended – although the minimal detailing may be too much for the purist. Superga’s always good too although not the slimmest. Agreed – Greats (and especially the Royales) seem to have really hit upon the perfect price/quality ratio as far as trainers go. I’ve bought two pairs! I occasionally wear runners (what we call trainers in Canada) with tailored clothing. That happens when I need to commute to the office by public transit. I haven’t really thought about making them stylish. I suppose it doesn’t happen frequently enough to want to buy expensive runners. Simon do you wear trainers this way out of choice or to spare your dress shoes the rough treatments of the commute? I’m what is referred to as a baby boomer. In the US we called these “sneekers” or “sneeks”. For the most part you had a choice of low tops, high tops, or tennis sneekers. At about the early to mid 70’s designer “sneekers” started to show up. At the same time “Jordash” jeans came on the market. In my view, you are looking at very simple products that are driven by advertising/manipulation offered at a very high price. As I see it, this is the model of corporations to promote their products made with nearly slave labor from over seas. Would be great to see some examples of outfits you would pair with trainers Simon. I like them with jeans (obviously) and lightweight beige chinos in the summer but find it hard to imagine them with flannels, or even darker coloured chinos. And I completely agree with the other commenters that Common Projects have become ridiculously overpriced recently. Anybody have any good alternatives? Love Buttero but agree they are a bit less sleek. Also really like Shoes Like Pottery but more to be worn with shorts and other very casual summer outfits. I was absolutely gobsmacked (and pleased – a similar vintage of a competing brand I was selling garnered zero attention) at what people were willing to pay, and the interest they generated….I sold them to someone in New York, who I believe, then re-sells them to hipsters in Tokyo…. Hi Simon do you (or anyone else) have any recommendations for a versatile travel-trainer for city breaks or short business trips? Normally when I travel I wear shoes or boots, depending on the nature of the trip, and pack a pair of trainers for off duty. Until now I’ve been making do with Converse Chuck’s but I was wondering if there was something better out there? Ideally I’m looking for something that I can wear to pound the tourist routes around cities, take somewhat ‘off road’ (the catacombs of Paris being a good example) or for jogging or a trip to the hotel gym and, at a push, wear for drinks or dinner when I don’t have time to go back to the hotel and change. The Chuck’s have been OK so far but are definitely lacking when it comes to jogging or the gym and I was hoping to find something a little more stylish for those times I’m trapped on the other side of a strange city and can’t get to my suitcase. I’m really loathe to pack a second pair as I like to travel as light as possible but I’m starting to think that one pair of trainers is never going to cover all of my bases. If anyone has any suggestions on makes/models or even just input on versatile colours that would work with dark jeans and khaki or navy chinos (again to maximise my packing options) it would be greatly appreciated! Hi BespokeNYC thanks for the suggestion. I had actually been looking at New Balance – having realised that they are made in the UK I was intrigued to see what they have on offer. I’m just not sure if I could carry them off. I’ve seen lots of shots of people who really make them work but I’m not sure if I could carry them off. I believe it is well worth looking at as she is very stylish but in a modern sense that in my opinion can be appreciated by all ages. I’m a fan of their “solid beetle” color, a dark grey-green, with black foxing. 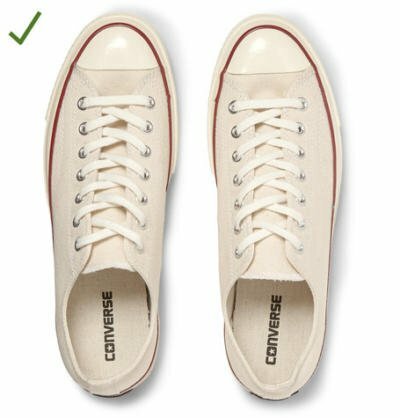 You don’t have to have fluorescent, magenta flowered trainers– the manufacturers all start out with white, like this Converse. Alas, none of these are returnable. I found this out the hard way, so if one goes this route, I’d recommend a visit to a trainer/sneaker store to confirm the fit. I’m not a fan of white sneakers, especially since I usually wear black or very dark denim. Trainers are, in my humble opinion, a staple that should remain in the “casual” bin. I own quite a few, and have a soft spot for Ferragamo and Jimmy Choo. I agree with Simon, these go nowhere farther than my Incotex chinos. I would also add, they have to look quite new to let me get away with that style. Anything else would make me look like a seedy college professor. What can I say, anything with a designer label is way overpriced. Even if the label says Made In France/Italy. It will vary a lot between brands I’m afraid – sometimes more than with dress shoes. Where do you stand on Emma Hope trainers? Trainers with jeans began to be worn in the 70s (excl. the greaser look of the 50s) and hit the fashion peak in the 80s along with acid wash denim. However it was the hip-hop generation that matched Chuck Taylor’s etc. with more formal wear, this was exemplified by Russell Simmons of Def Jam. Hip Hop artists matched high end quality with Street sensibilities resulting in Rocawear, Sean John, G-Unit etc. Hence the trainer’s here. However to match trainers to something more formal than Chinos the cut of the garment has to be louche. Traditional, formal cuts (esp flannel) are simply not ‘street’ enough to pull off the look. Whilst I agree that sleek should be the style to retain one colour (white) as a look is,I believe, wrong. Black, grey, burgundy all work but they should be in high end materials such as leather. Italian brands such as Ferragamo produce some of the best but it all depends on how it is matched. Correctly it adds elan, incorrectly and it can ruin an otherwise sensible outfit. At the risk of sounding stalkerish, good to see you leading by example in your white common projects on Lordship a couple of weeks back. Interesting article on trainers. Good article. I think we should be a little more open to ‘lux’ trainers for the simple reason that IMHO they allow the ‘older’ gentleman to stay casual without looking too try-hard. The problem stems from the fact that (again, IMHO) the ‘classic’ non-sports trainer brands (think Converse and Vans in particular) just look plain wrong on any man over the age of about 35. But the minimalist end of the lux trainer spectrum can actually look quite elegant and, worn with care, seem to me to work really well on those of us who want to stay casual but without looking like a middle aged-skateboarder. What about how to wear trainers chapter 2? It’s actually being shot this weekend… sorry for such a delay! 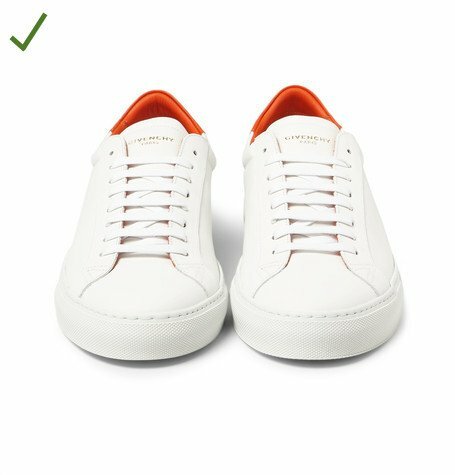 It seems Common Projects is the sneeker/trainer brand name on everyone’s lips at the moment. I’ve tried a few pairs on and I thought they were ok – the leather seemed to be of a high quality but the price was eye-watering (£400) – at least here in Hong Kong were they are stocked by Lane Crawford. I didn’t care for the fit/shape though. I couldn’t bring myself to spend that amount on trainers. I’ll happily pay upwards of £300 on a pair of Northamptonshire-made Goodyear welted shoes safe in knowledge they can be reconditioned for around £100 – the extra money is a pretty good investment. Which brings me to my next point: I recently bought a pair of Grenson’s “Sneaker 1” trainers. They are a really lovely, well-made shoe. The leather is fantastic, a subtle, understated design, no branding, great comfort and they cost me £130 delivered from the UK to Hong Kong (minus VAT, plus postage). With all the new brands popping up, would the white Achilles Low sneakers from Common Projects still be your top choice of trainers to wear with tailoring ? They’re still my favourite, but hard to justify on price. Actually, thinking about it, wouldn’t the ‘Court’ model even better in body your principals (as in even more minimalist than the ‘Achilles’ ? Yes, that’s what I was wondering about ! Thanks a lot ! Dear Simon, thank you for sharing your thoughts on how to wear trainers. I just got my first white trainer. I managed to purchase a Veja – French maker – Esplar model. Eventhough I looked over the three articles regarding this subject that you have written, I was not able to find a comment regarding using a matching – or not – belt. Could you please advise?